Both mats provide the necessary barrier between clean stone and the footing surface. The mats also help provide extra stability for the base, and you may even be able to use less base material. The mat will allow water to pass through the holes providedinto the clean stone base which will then take away the extra moisture at an efficient and consistent rate. The mat will also hold extra moisture in the mat's cups, which helps reduce the amount of water needed to keep the footing at the correct level. These mats also provide concussion benefits by absorbing more concussion than a traditional base in addition to a safety feature - if the footing gets low in an area, the horse will hit the mat and not cause any damage to the base or the animal. The footing can be re-graded and the area fixed very quickly. This same concept works if a harrow hits the mat. These new mats consist of a flat surface and are very light in weight, making them easy to install. They provide excellent drainage and amazing concussion values (bounce and forgiveness) for the horse and rider. The mats allow water to pass through easily and consistently. 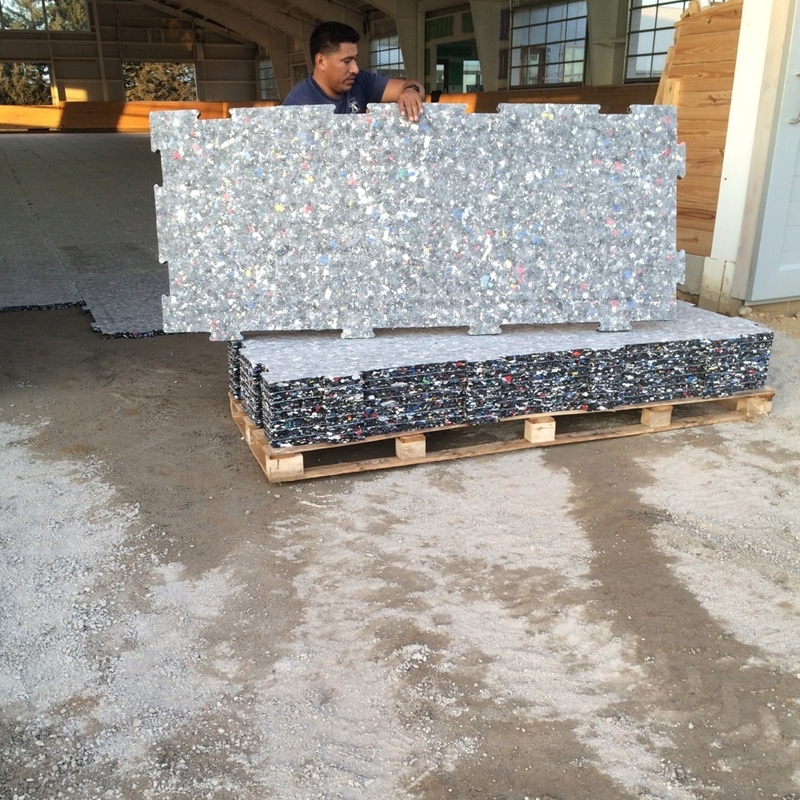 The mats are made from recycled rubber and are good for indoor and outdoor use. These mats do not hold moisture in the footing, but will help provide a safe and solid layer between the rock and the surface. These grids are used to provide better drainage in a free-draining base. They provide extra stability for the base and also require less base material. The grids will allow for good stability and the best drainage possible. The grids will not hold any moisture, they just allow for quick and very efficient drainage. The grids do require less footing. Only 3 to 4 inches of loose footing will be needed. The grid system has numerous application options. 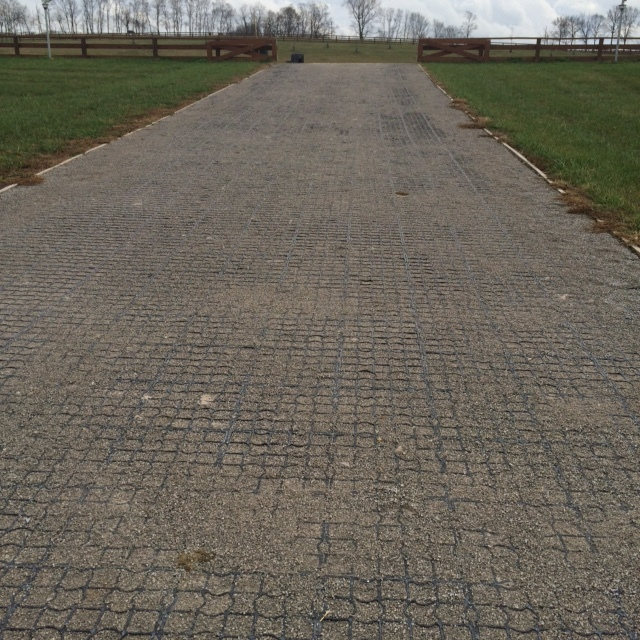 Because they stop erosion and provide such excellent drainage we have used them in paddocks, on roads, on riding paths, and on walking paths. If you have an area that is a problem drainage area this is a system worth exploring. There are two underground watering systems, Ebb and Flow and the HIT system. Although the HIT system requires a bigger investment, ultimately it saves time and money on a daily basis. FootingFirst™ highly recommends it. This system provides water from below using drip lines (with the grids to protect the drip lines). The grids also add concussion advantages. The HIT system is very consistent and very efficient, using the least amount of water for any water-dependent footing. The HIT system has a superior performance to many other below surface systems available. The HIT system drains very quickly due to the free-draining base below the surface, and also drains quickly when heavy rains prevail. This subterranean system is also good. However, it can be inconsistent due to the lay out and the much larger pipes used to carry the water. The Ebb and Flow provides an excellent surface that does keep good life and energy as the water is drawn up in a capillary format which helps to not compact the surface. Ebb and Flow can drain efficiently, however be sure to install the system correctly with a reputable company. When using a heavy duty fabric as a barrier between the clean stone and surface, it is very important that the fabric is installed correctly. The biggest benefit to the fabric layer is that it is very cost effective. When installing a free-draining base with fabric instead of mats there is a considerable cost savings. When installing the fabric over a free-draining base, 4 to 5 inches of footing for the surface layer is required. FootingFirst™ has installed many free-draining base systems using this high-quality, heavy fabric and the arenas have been managed very well. The fabric will provide an excellent barrier but needs more care and attention than the grid system or the new German Mats. A second view of a free-draining base installation.